Who Should Take the ‘Heat’ for the Melissa Etheridge/Sheryl Crow AARP Article? Sometimes I wish celebrities would just keep quiet about their disease woes and triumphs, but then they do often provide fodder for bloggers like me, right? That’s supposed to be sarcasm. Seriously though, I am all for everyone and anyone (including celebrities) sharing personal stories about cancer or whatever it might be. I am totally for free speech, sharing stories, offering advice, reaching out to help others and so on. But what I do not support is someone coming across as making her story the right story as Melissa Etheridge seemed to do in this piece, or more specifically, in the ‘lessons for all of us to learn’ image at the end of the article, which is the focus of this post. Many, including me, found some of her comments on the lessons page to be inaccurate and even offensive. But so what? Maybe some of mine are sometimes too. My problem with the article isn’t so much with what either of these two ladies said, well, except for that cancer is a gift comment they made almost in unison at the end of the article. Lordy, don’t get me started on that one, but I won’t digress to that topic in this post…My problem is with something else, which I’ll get to. I actually thought Sheryl Crow’s comments on the lesson page were okay. And on a side note, I reviewed Sheryl Crow’s cookbook way back when. It’s a lovely cookbook, but guess what? I have not used a single recipe from that cookbook. This alone might speak volumes about our different life styles, or maybe it just means I’m a lousy cook. ..
On the other hand, I didn’t care for much of what Melissa Etheridge said on her side of the lesson page. For instance, stating that when she got her body back in balance was when her cancer disappeared is misleading. Umm no, it disappeared because she had treatment. Suggesting we can control our environments and keep the mutations turned off, as if this is all in our power, is judgmental and problematic. And finally, stating that testing isn’t something she encourages other women to do, when in fact she had it done herself, is wishy-washy at best and at worst, just plain bad advice she has no business giving. In saying these things, I feel she stepped over some kind of line, though admittedly, what line I’m not entirely sure. Maybe it’s some sort of ‘brca line’. I don’t know. However, again, my main beef is not with the two women and what they said; no, it’s with AARP because of the manner in which this image of ‘lessons for all of us’ at the article’s end was presented. In a nutshell, this grand finale part is the biggest problem with the whole article for me. These are not lessons. They are opinions offered by two famous women who have had breast cancer and who happen to be doing really well right now, which of course, is a wonderful thing. From what I remember about lessons, you’re supposed to study them, learn them, practice them, and incorporate them into your mind or life. 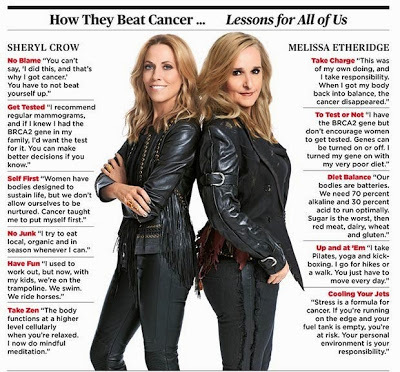 So if AARP had merely had a different title for that final lesson page, or inserted a few words like, these things are what Sheryl Crow and Melissa Etheridge believe, or something along those lines, things might have been fine and dandy, well, maybe just fine. Celebrity voices do matter. I checked Melissa Etheridge’s Twitter page and she has 63,000 followers. She has 460,000 fans on Facebook. Sheryl Crow has even more with 236,00 followers on Twitter and around 1,238,000 fans on Facebook. So celebrities do have a responsibility to preface opinions about important stuff like ‘how I beat cancer’ (which is a really dumb title for a cancer piece in a major publication in the first place) with ‘this is my opinion or experience’ or something to that effect. And major publications such as AARP have a responsibility to get the words, messages and yes, titles of article and images right too. AARP has taken some heat for this one, as they should. Okay. That’s it. I’m done. Until next time, and we all know there’ll be a next time. Note: I know everyone (including me) is sick of seeing the image below, but I felt I had to share it just in case anyone reading this post missed it. Were you offended by any part of this article, or more specifically, by this lessons image? Opinions, yes. Lessons for all? I think not. Exactly! Wish I had addressed this angle a bit in my post…so very well said! Kimberly, I guess you can see that I decided not to keep quiet after all. And I think we all blogged from a slightly different angle, which is how it should be. Thank you for reading my post and for commenting too. I had meant to address this in my article and forgot. Thanks for doing it so well. It’s a journalistic given that sensational sells. Saying someone “beat cancer” is a lot sexier than saying these two are okay and this is how they live now. btw, Nancy, I’m actually with you on the gift thing. While I may be more sympathetic to it and had a moment of my own “weakness,” I decided that having a catharsis, even making a great change as a result of cancer, does not make it a gift. As long as people still die from cancer and many more suffer, I prefer to not label it in that way. It feels disrespectful to those whose endings are not so lucky. Eileen, I agree that it feels disrespectful to those who die from this disease to call it a gift. There are so many reasons I cannot call it a gift. Thank you for reading. Your post made me get going on mine. Thanks for reading and sharing. right on. It’s presumptuous of AARP to title this “lessons for us all”. Bite me. It’s total crap. And it’s dangerous because AARP and these women have a broad reach, there is so much bad info out there. I want to see stories on “regular” women living with cancer and the aftermath. When people start sprouting “woo”, my brain shuts down. It’s offensive that two “stars” are touted as experts, any more than the rest of us are. But I think the error is mostly AARP’s editorial policy on this. And as for cancer as a gift- gag me. Elaine, I’m with you. I always much prefer stories about regular women. I agree that in this case, the error(s) are mostly with AARP. And yes, the gift thing… Love your comment. Thank you. Well said. Of my “what side offends me most”- award to Melissa. Ann, Thank you and I agree. Melissa’s side gets the ‘award’. Nancy – I love your point of view. – probably because I agree with you completely. Now that’s a gift! I don’t give give any of these types of articles/book credence. An actor/artist/musician can not will not be able to provide me with any medical advise. People are easily swayed by stardom as if they have some hidden information that the regular public is not privy too. Alli, Thank you for expressing your take on celebrity cancer stories/advice so frankly. I thought the problem with this article was more of a journalism one, although I do not appreciate or agree with some of Ms. Ehteridge’s comments. Everyone and anyone can share their story, but how it’s presented matters a lot IMO. You’re absolutely right; ME and SC are not experts and we don’t need to learn lessons from them. Thanks again. great post, Nancy! at first I was floored by irresponsible comments by both ME and SC and royally pissed at AARP. but with reading other posts discussing the controversy, I became more informed and disgusted with AARP and their use of journalistic tactics to sell their newsletter and garner AARP membership, i.e. the heading, “how they beat cancer…lessons for all of us”. and though I do believe that both women were remiss in foisting and touting their own beliefs and even provided erroneous information, it was up to AARP to take responsibility for a truthful and balanced feature. they chose not to do that. so I am writing a letter to AARP to express my disappointment and lack of trust, to include both the reporter and the editors – and am not renewing my membership in AARP. I loved this post, and feel so fortunate to get to read so many other thoughtful and insightful points of view. thank Nancy! Karen, As I said in the post, I think in this case there were journalistic issues/problems. Any woman can believe, share and say what she likes, but how it’s presented in a major publication matters a lot. AARP screwed up here. Good for you for not renewing and for writing a letter! You’re awesome, Karen. Thank you for reading and sharing your views. Much love back. Steff, These things do grate on one’s nerves don’t they? I will check out your post soon. Thanks for reading mine and for commenting too. Ooooh, you hit one of my hot buttons. I was infuriated by the AARP article. I thought the same thing: how could AARP do such a silly thing? Personally, I feel the opinion pieces shouldn’t have run at all as a cover story. I also found Sheryl’s viewpoint more common sense and less offensive than Melissa’s. Ironically, I was always a fan of Melissa Etheridge before her cancer and after she was diagnosed. I’m no fan now. She needs to stick to what she does best, making music and singing. It’s alright to share one’s viewpoint as a celebrity, but to say that one way is the truth is hard to swallow. And the nonsense that Melissa said was impossible to swallow. Yet, public consumption is real, and the general public may buy into these false ideas. Thank you for writing about this, Nancy. Great post! Beth, Thank you for reading and sharing your thoughts. I like your point about not making an opinion piece a cover-type story. Again, there was some journalistic mis-stepping going on here for sure. Thanks again. Thanks, Nancy for blogging on this. Considering the age of the population AARP addresses, ME’s “lessons” are dangerous, and if taken to heart could cost lives. Shame on AARP for publishing this, especially in the way they did. I’m not a member, and will remain so. Joyce, Thank you for reading and taking time to comment too. I believe that ‘celeb’ articles such as these can result in people shutting down so that they feel unable to say openly when at times they might feel really bad. Recently there was a tv journalist who, just at the beginning of her treatment said in a video blog that breast cancer treatment was ‘do-able’ – this is insulting to those who are unable to continue with their treatment for whatever reason. Celebrities have a responsibility to REALLY think before they speak out, e.g. dodgy dietary advice. Our day to day lives are full of ambiguity, ambivalence and complexity; let’s remember the article above is a 2 dimensional image in every respect! Saralou, Thank you for sharing your spot-on insights. I agree completely. I’ve always been a fan of both of these ladies but a few years ago I got into a huge argument at a gathering when a friend of mine told me cancer was a gift, knowing that my boyfriend died of cancer. The woman hosting the gathering died of cancer two years ago. And the woman I got in the argument with died from a head injury after that. I doubt she thought that was a gift. I’ve had several friends and family die from cancer because they don’t have insurance or even when they do. Cancer is most definitely not a gift. Terri, I’m sorry you’ve lost dear ones to cancer. Good for you for voicing your opinions at that gathering. Sad how things turned out for the host and for the person you argued with, too. Cancer is most definitely not a gift. Not for me and my family anyway. Thank you for sharing. 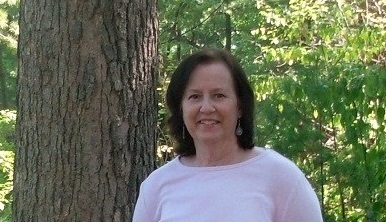 A Guest Post by Mary Landberg, Author of “Enduring Love,” & a Giveaway!